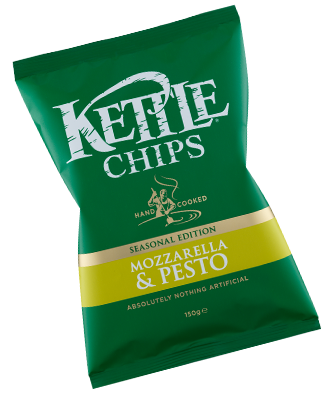 When you go for colour coded bags to differentiate between flavours as Kettle Chips do, you need to make sure there are sufficient colours left for new flavours - it's certainly a risk having Special Edition flavours like these! The dark green is a little dull, but that cannot detract from what is a perfectly well designed bag. The Snap Test found a nice firm crack of a whole Crisp as it split in half. Put a couple together and you feel like you are eating a firm biscuit or cracker. There wasn't the brittle snap of a regular Crisp, but instead a firm, hearty crunch. There were not many large Crisps, but most were fairly flat, which is unusual for Kettle Cooked Crisps. There were some bubbles, but not the quantity you see on Crisps that have been fried for a long time. They had a sort of dark yellow tinge to them, with some visible potato skin on the edges. There was also some seasoning, including a smattering of dark flecks. There were some half transparent Crisps that had suffered from the oil, but not many. If you put some freshly laundered clothes in a drawer for a couple of days. Then remove them. Then return to the drawer the following day, this is the fresh sort of nothingness that will greet you. The flavour however, was exactly what it says on the pack. 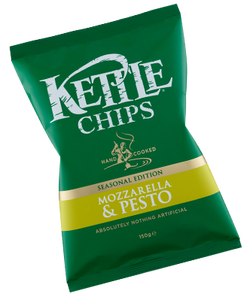 The Crisps have a creamy mozzarella taste with a clear nutty pesto partner in combination. Neither overwhelms the other and the balance remains throughout a whole eaten bag.